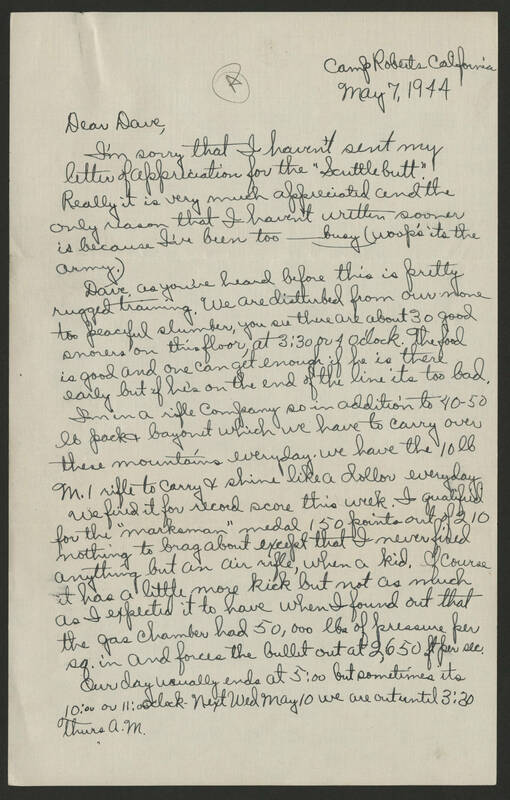 Camp Roberts, California May 7, 1944 Dear Dave, I'm sorry that I haven't sent my letter of appreciation for the "Scuttlebutt." Really it is very much appreciated and the only reason that I haven't written sooner is because I've been too----- busy (woop's it's the Army). Dave as you've heard before this is pretty rugged training. We are disturbed from our none too peaceful slumber, you see there are about 30 good snorers on this floor, at 3:30 or 4 o'clock. The food is good and one can get enough if he is there early but if he's on the end of the line it's too bad. I'm in a rifle company so in addition to 40-50 lb pack and bayonet which we have to carry over these mountains everyday. We have the 10 lb M1 rifle to carry and shine like a dollar everyday. We fired it for record score this week. I qualified for the "marksman" medal 150 points out of 210 nothing to brag about except that I never fired anything but an air rifle, when a kid. Of course it has a little more kick but not as much as I expected it to have when I found out that the gas chamber had 50,000 lbs of pressure per sq. in and force the bullet out at 2,650 ft per sec. Our day usually ends at 5:00 but sometimes it's 10:00 or 11:00 o'clock. Next Wed May 10 we are out until 3:30 Thurs A.M.